In theory, order-to- cash is a single “mega” process that moves an order through the organization from sales through delivery, billing and finally to payment processing. In reality, however, order-to- cash touches many different departments that may or may not be willing to work together. Improving the order-to- cash process is a priority for many organizations. To be able to keep customers happy, sell and deliver more products, and make quarterly and annual revenue targets, many organizations are also willing to invest in substantial process improvements. But the question remains: Where is the best place to start? Many organizations start by adopting new solutions or automating an existing process, thinking this will solve the problem. However, technology is only one part of the solution. In fact, adding new technology may accentuate or exacerbate the underlying problems in the process and delay the time required to make necessary changes. To win the global process transformation race, organizations must carefully analyze the order-to- cash process and then identify ways to transform it quickly so it works more efficiently from start to finish. Large, expensive changes aren’t always necessary. Fixing seemingly small problems and leveraging existing technology can deliver big benefits to an organization if the changes keep orders moving reliably through the organization with minimal effort. The level of complexity and coordination in O2C is the greatest challenge. Sales orders, for example, are plagued by the problem of order complexity. For many companies, the dynamic nature of the sales cycle can result in frequent changes to product offerings, price lists and pricing models. This complexity can cause major disruptions further along in the O2C process. To solve this problem, organizations should strive to reduce order complexity so customers or sales representatives can enter orders quickly and accurately the first time. Even when order complexity is minimized, many organizations still struggle with sudden, unexpected increases in sales volume, either due to the introduction of a popular new product or seasonal fluctuations in business. Reducing manual touch points is one simple step organizations can take to improve sales order processing to handle increased order volume more efficiently and safeguard current and future sales. 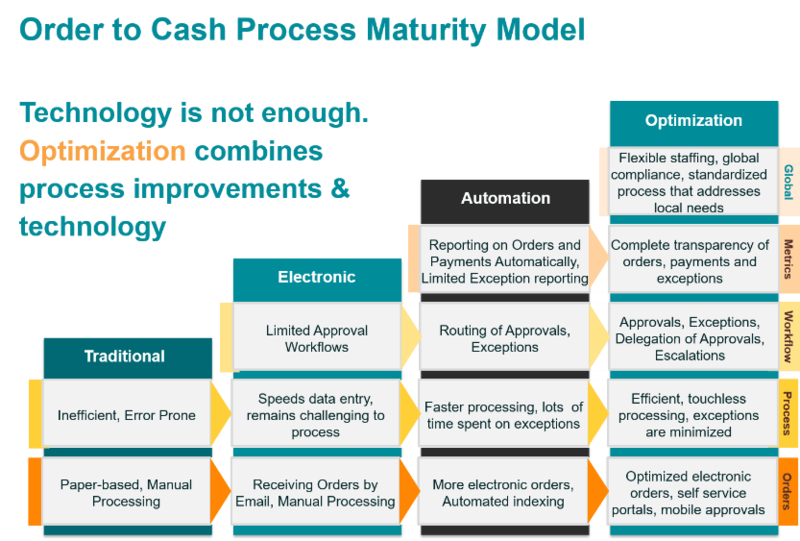 To improve processing, organizations should examine the unique aspects of their order-to- cash process and uncover the specific reasons why orders are blocked. In some cases, problems can be easily fixed using simple updates to existing practices; in other instances, larger process innovations may be necessary. This will help organizations prioritize the changes. Understanding the unique challenges in the O2C process is only the first step in the global process transformation race. The next action to take is for organizations to review which improvements will add the most value for the organization. Start by considering how each improvement will increase the accuracy, speed, or transparency of the O2C process. For example, under Order Management, inaccurate orders costs money, quick turnaround of orders is essential, and lack of visibility increases exceptions throughout the process. With accounts receivables, misapplied payments take time and are costly to rework, delays in applying cash can lead to credit holds and impaired cash flow and a lack of visibility can lead to excessive bad debt write-offs. With this mindset, O2C process owners can determine the specific requirements for process improvements that will deliver the most value to the organization. Once a list of potential improvements is defined, O2C process owners can start to formulate a plan of attack. Collaboration is essential. Process owners should consult closely with the various stakeholders to determine the best approach for introducing process improvements across the organization. Choosing the right approach depends largely on understanding how the organization’s process improvement goals fit on the process maturity model. Organizations at the early stages of process improvement often start by introducing new systems and automation as a fast way to transform broken processes. However, adding new systems can add complexity to an already broken process, delaying the return on investment from process improvements. If the ultimate goal is process optimization, organizations should look for ways to introduce process improvements that are supported by, not driven by, technology. For organizations using SAP systems, consider whether any of the process improvements can be achieved by leveraging those systems. Are there ways to introduce workflows to improve the processing of information? Can SAP applications help push information between various stakeholders to reduce friction in the process? Are there third-party solutions that provide critical functionality that the organization needs to move to the next level? The process improvements can often be delivered faster and at a lower cost by making the most of existing investments in SAP applications and augmenting it with new technology that provides critical differentiators. If business owners or stakeholders are reluctant to use SAP applications or are unfamiliar with what kind of innovations are possible, consider finding champions in the organization who can explain the benefits in simple business terms. Try to win over management and gain employee support by keeping a strategic perspective and focusing on success stories that demonstrate how teams were able to improve collaboration and empower stakeholders in different business units or operating in locations around the world. Ultimately, successful process improvements are the result of clearly understanding business requirements and then thinking critically about how to use technology to deliver the required functionality. By leveraging the power and flexibility of the existing ERP system, global process owners will be able to deliver a better solution, faster, and at a lower overall cost to the organization.